Authentic Byzantine jewelry was created during the Byzantine Empire, from the fourth century AD to approximately the mid 1400s. 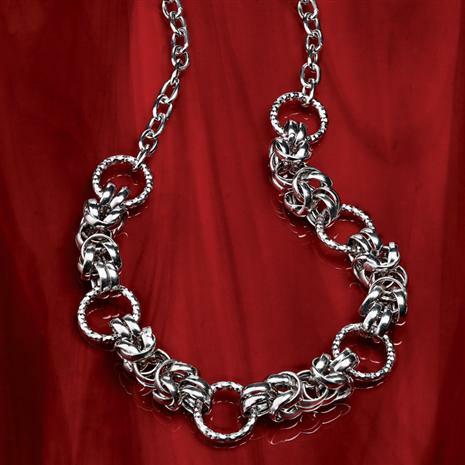 Today, the elaborate beauty of Byzantine chains still dominates the jewelry world. That’s what we call timeless. Timeless can also be prohibitively expensive. But we have a way turning back the clock on prices. To get the bold look of Byzantine design in a precious metal without pushing four figures we went to Italy’s epicenter of metalwork–– Arezzo. There we found a family who have been creating jewelry of international acclaim for over three decades. Integrating the best of tradition with innovative techniques they have made the out-of-reach within easy grasp. The Bizantina Moderno Collection updates bold Byzantine style with fresh modern touches. Each sterling silver link is made by hand with the classic Byzantine links delivering a high polish while the O-links glisten with a textured finish. The links are strategically light, which is the secret to their amazing wearability and affordability. Go timeless for less with a piece or two from this collection, and lose the zeros not the impact.